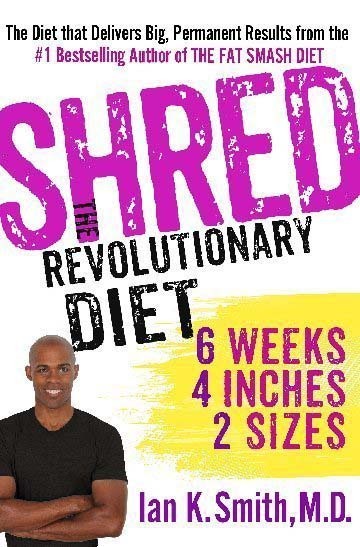 Today, SHRED, The Revolutionary Diet: 6 Weeks 4 inches 2 Sizes is still #1 on the New York Times bestseller list, helping thousands of people (SHREDDERS) on the SHRED program lose weight. “When it comes to dieting, a diet should not be expensive or complicated and it should not ask you to eat perfectly. SHRED asks you to eat a little better but not perfectly,” exclaims the creator and founder of The 50 Million Pound Challenge and The Makeover Mile. Having written nine well-known books, he gives two greatly distinctions of SHRED, The Revolutionary Diet. “On the SHRED program you eat four meal replacements and 3 snacks a day. You eat 3-4 times a day. You keep your metabolism ravished [and] you keep your insulin levels nice and stable.” He continues. “The second thing the program does is called ‘Diet confusion’…that’s very analogous to the concept of muscle confusion that weight-lifters use…use the type of food that you eat and the calories that you count in day to day, week to week. That keeps your body up tittered,” plainly he expresses. Dr. Ian K. Smith is also a humanitarian. He has won numerous awards for his work, as well as teaming up with notable organizations that have made a remarkable difference to mankind. He was recently appointed to the President’s Council on Fitness, Sports, and Nutrition by President Obama. He shares with the readers his experience. “Well it has been a wonderful experience. When the president appointed me I was very honored. We worked very closely with the first lady Let’s Move campaign. I’m very excited that we have a first family that’s not only verbalizing their interest in people eating healthy but they also live that kind of life,” excitedly the doctor conveys who is proud of being on the council with like-minded people who are trying to get the country to eat better. Many times in the black community, people tend to not be conscious of the importance of health issues. The United States census reports that there is a far less number of males than women who visit the doctor’s office. Unfortunately, in underprivileged areas the seriousness of the health issues tend to go ignored. “I think that as either African American males or females, we have to eliminate these fears about becoming health conscious by having a better understanding of who we are and what we are, and what makes us tick from a stemological standpoint. We as a community in order to live happier, healthier and longer, we have to be invested in who we are and what we are in an extreme of knowledge. Medical knowledge and having an understanding of what’s going on with you may be a little scary at times, but the knowledge itself is what people need to actually call for a resolution to live a healthier life,” sharply says Dr. Ian K. Smith.